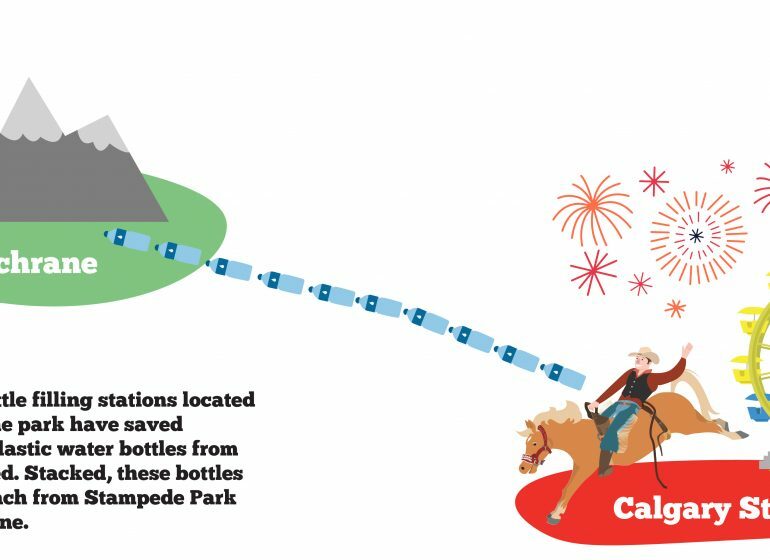 Eating vegan on the Stampede Midway? Yes it’s possible and yes it’s delicious! 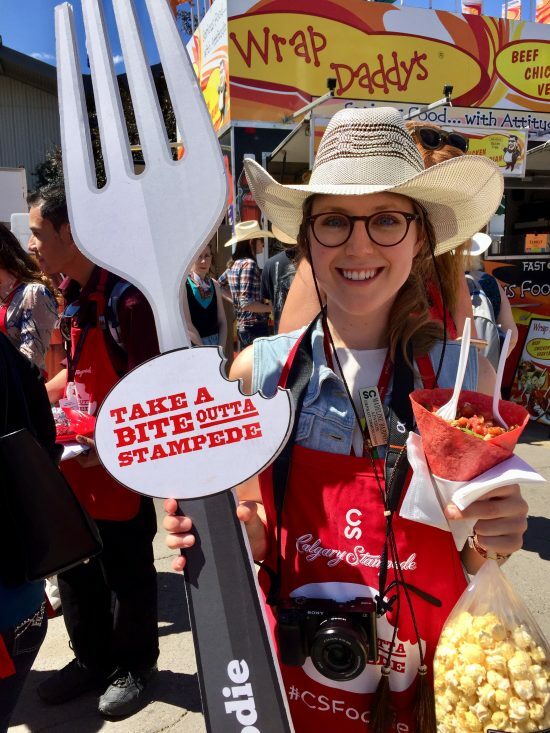 From the sweet to the savoury, the extravagant to the simple, the 2018 Calgary Stampede Midway is packed with vegan options that are sure to delight even the toughest critics. 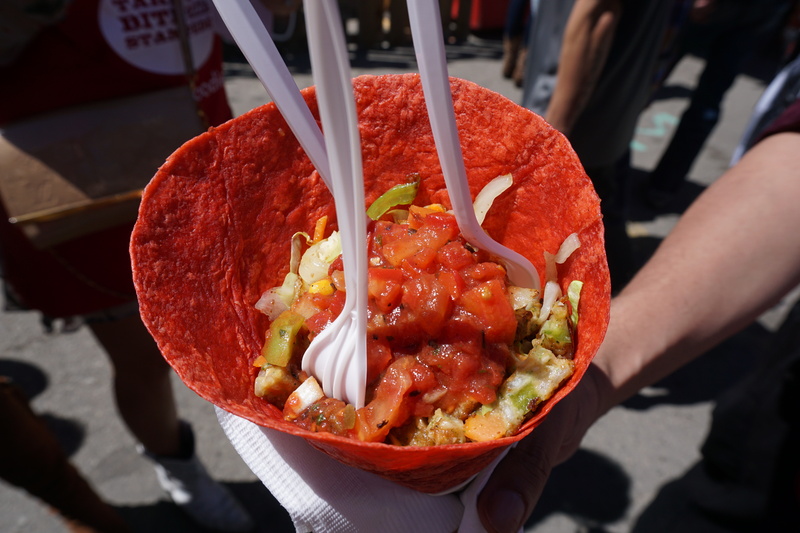 I spent the afternoon on Sunday, July 8, 2018 participating as a guest judge in the #csfoodie “Best Vegan on the Midway” tour. I joined a group of 15 hungry vegans as we made our way across Stampede Park sampling eight different vegan delicacies. 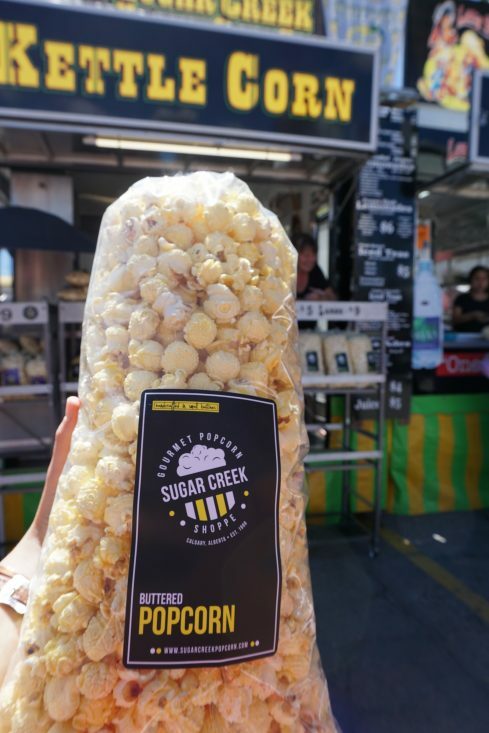 Our first stop on the tour was at Sugar Creek Kettle Corn Co. to taste their Vegan Butter Popcorn. With a perfect crunch, and a consistency that did not get caught between my teeth, my first thought was that it tasted just like movie theatre popcorn! 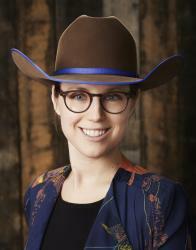 A jumbo bag costs $9 and to me that was a fair price knowing that the popcorn is a local, Calgarian company, and that everything in their kitchen is made dairy-free; this includes their famous sweet kettle corn flavour. The Butter Popcorn was the perfect appetizer to what would become a very delicious, and filling, afternoon. Next up, we stopped at the Family Squeezed booth and were allowed the option of choosing any of the lemonade flavours. I chose the lavender, as did many others on the tour, but other popular choices were an orange/ginger combination, and a blueberry basil twist! The large size was more than enough for me, and would be a great way to cool off on a hot summer day. If I were to go back, I would ask for the lemonade to be made with no sugar because it was a little too sweet for me. The time for real meals had arrived and the first up was Avatara’s Crunchy Cowboy Pizza. 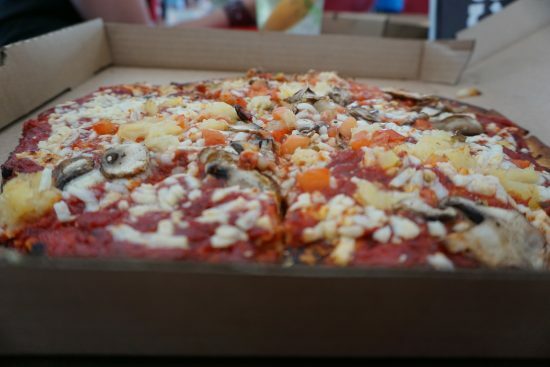 Avatara is my personal favourite pizza shop in Calgary so I was a little biased with their review – but the vegans around me seemed to all agree. A thin crust, 100 per cent gluten-free, pizza was topped with cashews for protein, vegan cheese, pineapple, tomato sauce and mushrooms – and in true vegan style, they left off the honey that is usually added to this order. Avatara’s owner spoke of his passion for good food and serving his customers, explaining that any of their pizzas, including meat options, can be made fully vegan upon request. Next was a spinach flatbread from Sal’s Flatbread Co., another local Calgary company! 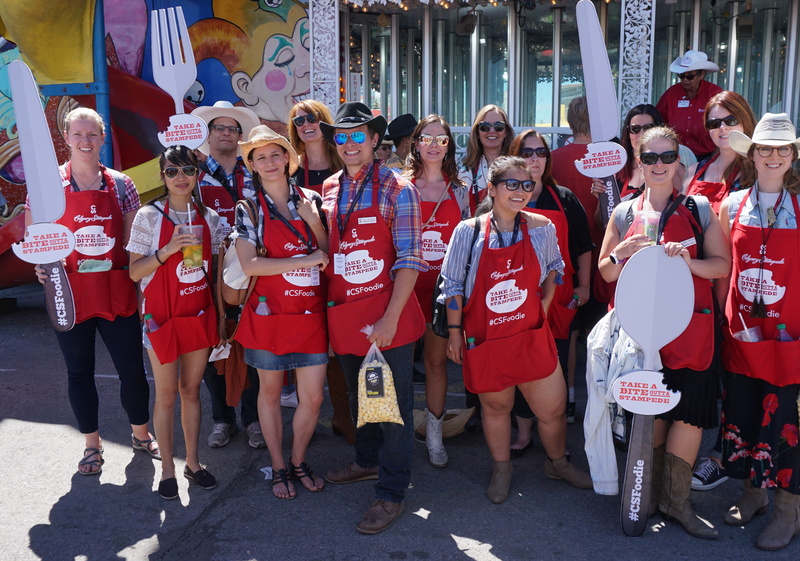 It was great that so many local businesses were included on the food tour because this showcases the possibility to eat their delicious products not only during the Calgary Stampede festival but also year-round. Hot out of the oven, these folded flatbreads kept warm and toasty as they travelled across the Stampede Midway to our picnic table pit stop. A little bit of spinach to get in our greens felt like a warm hug to a vegan soul. It wouldn’t be a full Stampede food tour if we didn’t eat something on a stick – so Falafel on a Stick it was, served up by Santa Lucia Greek Grill. The falafels were very big and cooked to perfection. 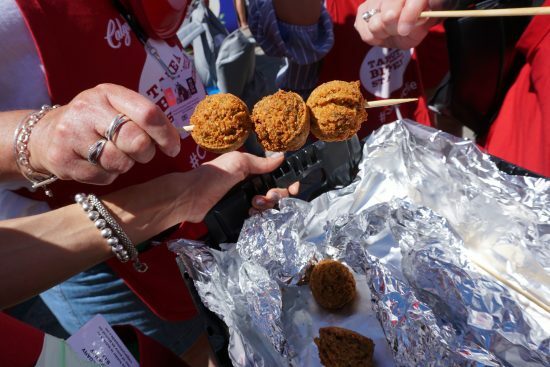 A crispy outside with a soft centre, I recommend these falafel balls as a fun food for sharing! This is my sixth Stampede as an employee and every year I have heard amazing thing about Wrap Daddy’s wraps. 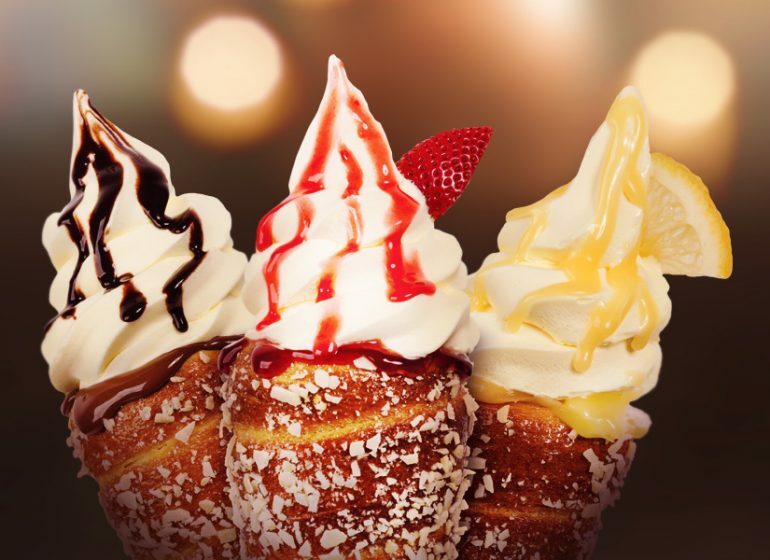 They come in an edible cone so they’re easy to eat, and I believe they have won Stampede Midway awards ~24 times in various categories! I’ve even heard that the vegan “chicken” they serve has tricked many people who have tried to return their order based on thinking that they were served real meat. For some reason, I never made it to their booth but am absolutely thrilled that they were on the vegan #csfoodie tour today. I rated Wrap Daddy’s wrap a 10/10 as it was truly delicious! Highly recommend! And taste, presentation and value aside, it is very humbling to hear of the owner’s passion for delighting his guests; every morning during Stampede he makes fresh salsa from real tomatoes to use in his wraps. His pride in his cuisine can surely be seen, and tasted, in all of Wrap Daddy’s items. It was at this time that the bulk of the group was getting pretty full – and with two items left, the All Vegan Poutine seemed like a daunting task. But as soon as the poutines came out, we collectively swarmed the containers with our forks. “I feel like I just got a second wind!” one of the vegan judges said. 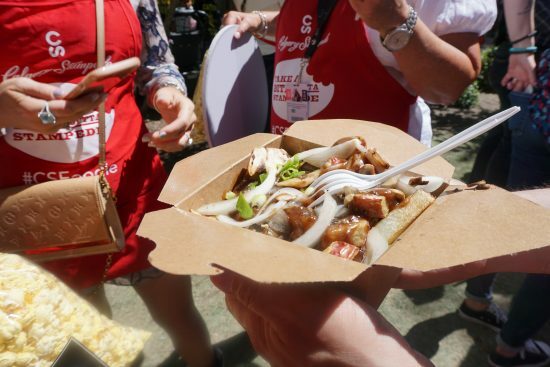 The All Vegan Poutine is one of Poutine King’s new menu items for 2018 and let me tell you – I will definitely be back this Stampede to eat it again! This was one of my absolute favourites of the food judging experience, and I know it was with my fellow judges as well as each poutine container was scraped clean to the bottom. Vegan cheese can be hard to melt, and cheese is a very important factor in a poutine. The All Vegan Poutine had the perfect melted cheese, mixed with a mushroom gravy and even some sliced veggies on top. The French fries were made from real potatoes and were thick cut. It was absolutely delicious and a crowd pleaser to all. To end our judging experience, we visited the Fresh & Local Farm Outlet booth in Weadickville. 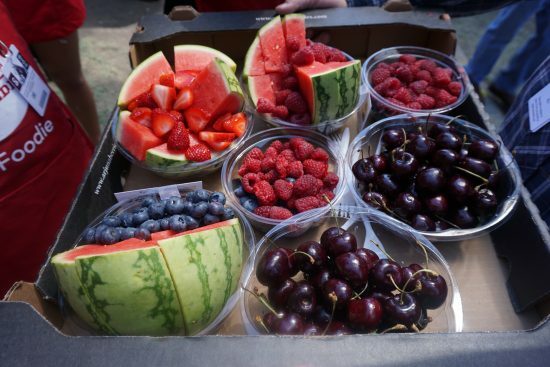 Huge bowls of seasonal fruits were brought to our table and were a refreshing site among the deep-fried vendors surrounding us. The fruit was all local and extremely juicy, sweet, perfectly ripe and just plain delicious. I recently told one of my coworkers that I don’t usually like watermelon because it often tastes like water, but I would quickly take that remark back after tasting these watermelons. 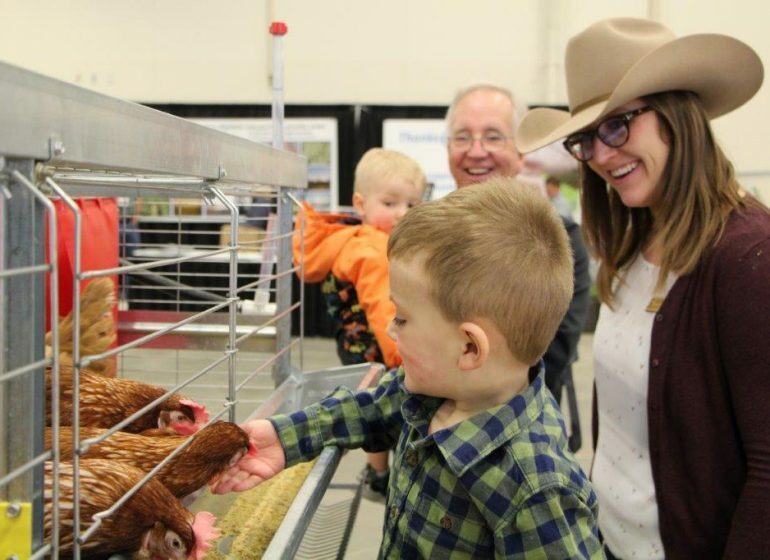 With a satisfied appetite, and an even greater satisfaction in experiencing first-hand how many vegan options are on Stampede Park, we ended the tour with smiles on our faces. 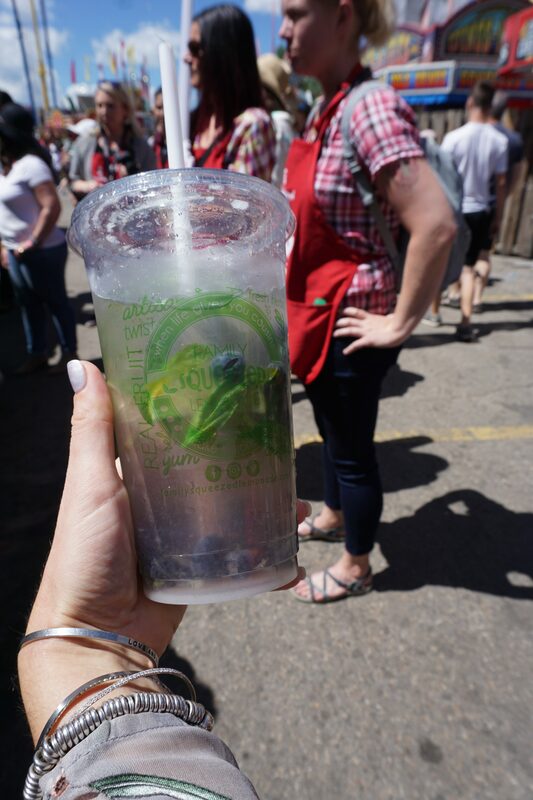 Tiangha conducts #csfoodie tours throughout Stampede, including tours dedicated to gluten-free items, international items, savoury items, sweet items, most inventive and more. 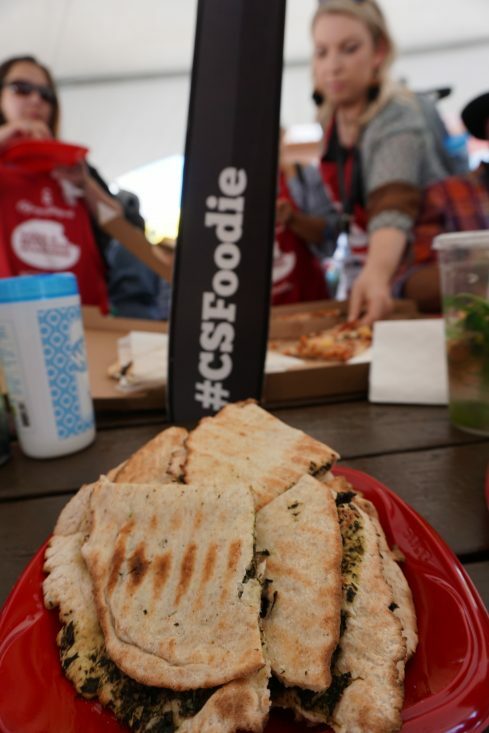 Follow along with the fun on social media, like Instagram and Twitter, using #csfoodie. You can also check out this blog post showcasing several additional food sensitivity-friendly items, as well as this map for help finding the vendors mentioned above. PS. These were not on the tour but two of my all-time favourite vegan Stampede Midway items are the Vegan Chocolate Chip Cookie Dough from Cookie Dough YYC and Traditional Fried Bannock from the Bannock Booth in Indian Village!